A total of 40,982 patients underwent LC with CDL in 2002; 27,739 had either ERCP (93%) or CBDE (7%). Mean age was 52.7 ± 0.4 years, with 74% women. Mean THC were less for CBDE ($25,200 ± $1,800) than for ERCP ($29,900 ± $800, p < 0.05). Mean LOS was less for CBDE (4.9 ± 0.2 days) than for ERCP (5.6 ± 0.1 days, p < 0.05). PS adjusted analysis revealed an estimated overall cost savings of $4,500 ± $1,600 and reduced LOS (0.6 ± 0.2 days) per hospitalization for CBDE. Mean THC, LOS, and estimated costs across PS score balanced strata were generally higher in the ERCP group compared to the CBDE group. LOS contributed 53% to increased THC and 62% of estimated costs. 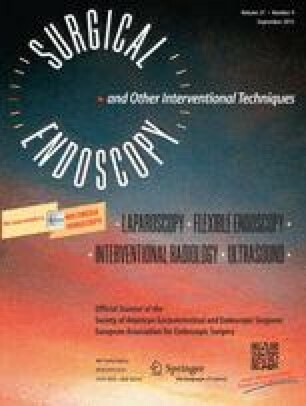 A higher cumulative incidence of complications was evident with CBDE (0.5–4.6%) compared to ERCP (0.3–3.6%).